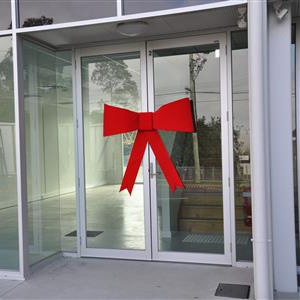 Our Big Door Bows and Giant Velvet Bows make a striking promotional impact for almost any business. Big Door Bows are in high demand by Real Estate Agents to make the experience of buying a property one their clients remember. There’s nothing like the visual impact of being welcomed to your new home by a huge bow wrapped around your front door! Clients feel special and remember that feeling (and the Agent who made it happen!) for a long time. Our Big Door Bows are easy to assemble (we provide step by step instructions), reusable, and pack a real punch for a low cost. Our minimum order is only 5 bows. Big Door Bows are 55cm across and constructed of 15cm wide ribbon. Since Big Door Bows come with extra lengths of ribbon to wrap around a door, they are also perfect for embellishing everything from major appliances (like fridges), giant boxes, and those items that are just too huge to wrap. Our Big Door Bows come in red and navy as standard, but we can supply them in a range of other colours – contact us for minimum order numbers and pricing for colours other than red and navy. Price: $29.95 plus GST per Big Door Bow (minimum order of 5 bows). Plus delivery. Our Door Bows are in stock and ready to send to you now! Our Giant Velvet Bows are making a splash at Car Dealerships, in shops – especially during sales and Christmas time – and all kinds of special occasions. They are dramatic, eye catching and irresistible. The Giant Velvet Bows are available in two sizes, depending on the purpose and how big an impact you want to make. The medium size is 95cm across, and the large size is 130cm across. Our minimum order is only two bows. The Giant Velvet Bows are incredibly easy to assemble (we provide step by step instructions), and you can reuse them – again and again. Fill the form below if you have any question or to place your order or click on [email protected] to email usFill the form below to place your order now or click on 1300 854 434 to call us if you have any question or click on [email protected] to email us. Our Giant Velvet Bows are in stock and ready to send to you now! Please note that our ‘Free Sample’ offer does not apply to Big Door Bows or Giant Velvet Bows.